Interesting !! Trump just announced the creation of a new military arm of the US gov called Space Force. Seems Space Force has secretly been around for many years. “From the ostensible Big Bang to the present, human civilisation represents an infinitesimally small fraction of time and yet we fancy ourselves at the cutting edge of evolution in the universe”. I’ve believed that for a long time. 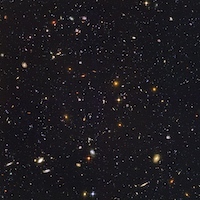 When the immense age of the universe is taken into consideration, around 13.8 thousand million years, it is clear that any extra terrestrial civilisations that have managed to pop up in the billions of known galaxies could be millions or even billions of years more advanced than us. That’s assuming the alien races have found a way to survive the eons... I also believe the cosmos is teeming with life in most of the habitable zones around quadrillions of stars. Scientists say there are more stars in the heavens than grains of sand on every beach on earth! Next time you are at the beach sifting sand through your fingers, try to imagine how vast this universe really is. yes that quote stood out for me also.